Getting started is simple. Just a few easy steps and you’ll be tracking attendance. Setup and name your events. Creating your attendance tracking event, or multiple events is easy. Simply provide the event name, dates and location. You’ll also want to upload your print quality logo for use on your name badges, or scannable sign-in sheets. You may also specify up to 10 custom data points or “custom fields” to include for your event data collection. For instance, you can have a custom field to store attendee dietary preferences, or other special needs. Excel uploads allow for quick importing of your attendee groups and sessions. ScanTrakk also allows you to upload multiple spreadsheets to segment your attendees into groups such as, sponsors, VIP guests, and staff, letting you use customized name badges for each group. Manual input of attendees and sessions is also possible for those last minute registrations and session changes. Meet our Name Badge Builder. Choose a 1D barcode or a QR code. Upload up to 5 print quality images to use in your design, in addition to your logo. Export badges to PDF for easy printing to the selected Avery template. If you choose not to utilize name badges, you can print scannable sign-in sheets, or adhesive labels that include your attendee names and barcodes. Professionally-produced custom name badges are also available by special order. Please contact us for a quote. 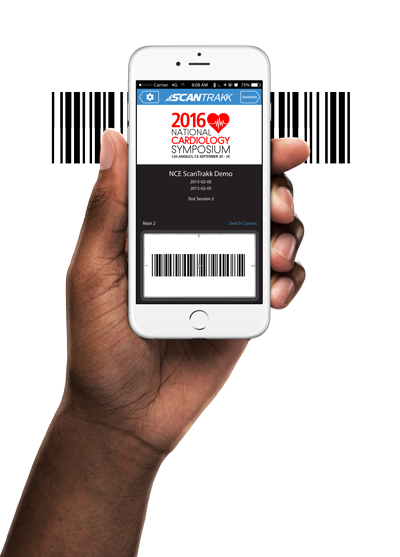 Download our free Scanner app from the App Store. Our Android app will be available in the future. Our reporting tool allows you to customize reports that you can access from your web browser. See the metric of your event attendance with reports you control. Gain valuable insights, such as crowd flow and interests, or for session attendance tracking, including CEU, session room, time in session, speaker, and more. With an internet connection on your smartphone or tablet, you will be able to view all your scan data in “real time”, as it is pushed to the cloud. Sign up and take us for a free test drive, today! Receive 50 free scans when you sign up. No credit card is required.